HOUSTON – Houston complex commercial litigation and intellectual property law firm Ahmad, Zavitsanos, Anaipakos, Alavi & Mensing P.C., or AZA, and three firm partners have earned recognition in the 2018 edition of Benchmark Litigation, a peer-review guide to top lawyers and firms. 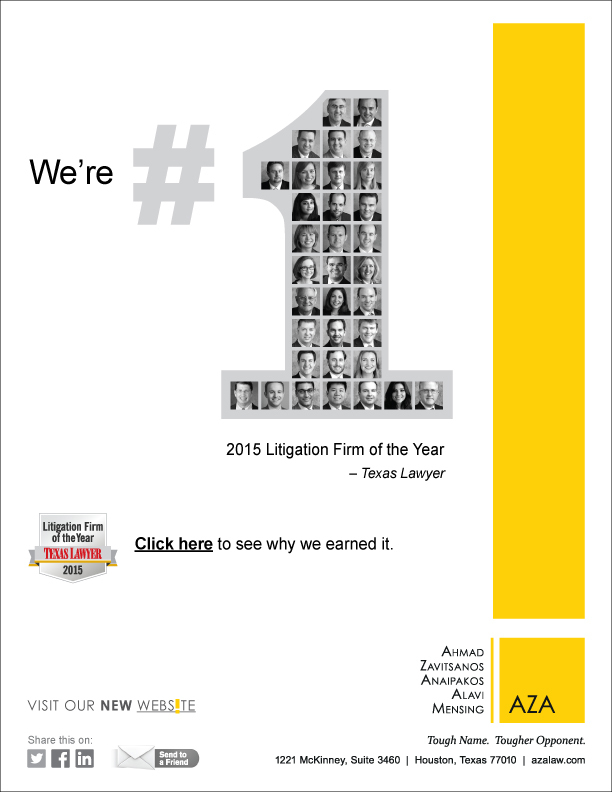 AZA received a “Recommended” rating for the third time from Benchmark Litigation. Now in its 11th year, the rating guide bases its selections on months of research, extensive interviews with litigators and their clients, and a review of casework. The three partners are also listed as top Texas lawyers in the 2017 edition of Chambers USA: America’s Leading Lawyers for Business and are included in the 2018 edition of The Best Lawyers in America. In addition, all three are on the 2017 Texas Super Lawyers Top 100 list for Houston. Ahmad, Zavitsanos, Anaipakos, Alavi & Mensing P.C., or AZA, is a Houston-based law firm that is home to true courtroom lawyers with a formidable track record in complex commercial litigation, including energy, intellectual property, and business dispute cases. AZA is recognized by Chambers USA 2017 among the best in Texas commercial law; by U.S. News – Best Law Firms as one of the country’s best commercial litigation firms for 2017; and previously by Law360 as a Texas Powerhouse law firm. National corporate counsel named AZA one of the country’s best in client service among law firms serving the Fortune 1000.